Michael Todd Wolfe is an American convert to Islam who attempted to travel to Syria to join ISISScott Shane,” From Minneapolis to ISIS: an American’s path to jihad,” New York Times, March 21, 2015, http://www.nytimes.com/2015/03/22/world/middleeast/from-minneapolis-to-isis-an-americans-path-to-jihad.html.. Wolfe planned to travel to Denmark via Icelandair, and then to Turkey, from where he would cross over to Syria.Ben Brumfield, “Texas man pleads guilty to attempting to join ISIS’ jihad in Syria” CNN, June 28, 2014, http://www.cnn.com/2014/06/28/justice/texas-terror-arrests/. Wolfe intended to bring his wife and two children with him on the trip.U.S. District Court for the Western District of Texas, “United States of America v. Michael Todd Wolfe, aka ‘Faruq,’” Los Angeles Times, June 27, 2014, http://documents.latimes.com/michael-wolfe-complaint/. Wolfe was arrested at George Bush Intercontinental Airport in Houston, Texas, on June 17, 2015, as he attempted to board the plane to Toronto, the first stop on his would-be journey to Syria.Ben Brumfield, “Texas man pleads guilty to attempting to join ISIS’ jihad in Syria” CNN, June 28, 2014, http://www.cnn.com/2014/06/28/justice/texas-terror-arrests/. In the same month, he pled guilty to “attempting to provide material support and resources to a foreign terrorist organization,” in federal court in the Western district of Texas.Ben Brumfield, “Texas man pleads guilty to attempting to join ISIS’ jihad in Syria” CNN, June 28, 2014, http://www.cnn.com/2014/06/28/justice/texas-terror-arrests/. Wolfe appeared in court again on June 5, 2015, and was sentenced to 82 months in prison.“Texas man sentenced to 82 months in prison for attempting to travel to Syria to join ISIL,” U.S. Department of Justice, June 5, 2015, https://www.fbi.gov/sanantonio/press-releases/2015/texas-man-sentenced-to-82-months-in-prison-for-attempting-to-travel-to-syria-to-join-isil. The Wolfes planned their trip alongside two undercover FBI agents who they believed shared their intention to reach Syria.Ben Brumfield, “Texas man pleads guilty to attempting to join ISIS’ jihad in Syria” CNN, June 28, 2014, http://www.cnn.com/2014/06/28/justice/texas-terror-arrests/. Wolfe’s wife told an undercover FBI agent that she supported her husband’s pursuit to “perform a violent form of jihad,” according to the criminal complaint.U.S. District Court for the Western District of Texas, “United States of America v. Michael Todd Wolfe, aka ‘Faruq,’” Los Angeles Times, June 27, 2014, http://documents.latimes.com/michael-wolfe-complaint/. Wolfe originally planned to join al-Qaeda’s affiliate in Syria, the Nusra Front, but shifted his plans to join ISIS when tensions between the two groups began to intensify. Wolfe declared he was more “in line” with ISIS, according to the criminal complaint.U.S. District Court for the Western District of Texas, “United States of America v. Michael Todd Wolfe, aka ‘Faruq,’” Los Angeles Times, June 27, 2014, http://documents.latimes.com/michael-wolfe-complaint/. Throughout a series of phone calls, the FBI agents discussed with Wolfe his travel plans and goals for once he arrived. The agents were able to confirm Wolfe’s plans to join the terror group and identify his travel date of June 17, 2014.Ben Brumfield, “Texas man pleads guilty to attempting to join ISIS’ jihad in Syria” CNN, June 28, 2014, http://www.cnn.com/2014/06/28/justice/texas-terror-arrests/. Wolfe expressed hesitation to join ISIS abroad because of his family and financial issues.U.S. District Court for the Western District of Texas, “United States of America v. Michael Todd Wolfe, aka ‘Faruq,’” Los Angeles Times, June 27, 2014, http://documents.latimes.com/michael-wolfe-complaint/. He told undercover FBI agents that “if he was single, he would have already left,” according to the criminal complaint.U.S. District Court for the Western District of Texas, “United States of America v. Michael Todd Wolfe, aka ‘Faruq,’” Los Angeles Times, June 27, 2014, http://documents.latimes.com/michael-wolfe-complaint/. FaruqBen Brumfield, “Texas man pleads guilty to attempting to join ISIS’ jihad in Syria” CNN, June 28, 2014, http://www.cnn.com/2014/06/28/justice/texas-terror-arrests/. 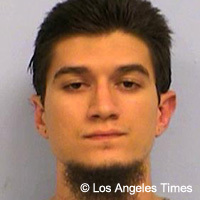 Michael Todd Wolfe is an American convert to Islam who attempted to travel to Syria to join ISIS. “…but now…I’m back to going, so I’m kinda like scrambling.”U.S. District Court for the Western District of Texas, “United States of America v. Michael Todd Wolfe, aka ‘Faruq,’” Los Angeles Times, June 27, 2014, http://documents.latimes.com/michael-wolfe-complaint/. “It’s not that I don’t want to go, I just need to figure out the best situation.I would rather leave than sit…I’m getting too comfortable sitting here.”U.S. District Court for the Western District of Texas, “United States of America v. Michael Todd Wolfe, aka ‘Faruq,’” Los Angeles Times, June 27, 2014, http://documents.latimes.com/michael-wolfe-complaint/.